Ballet impresario Sergey Pavlovich Diaghilev and composer Sergey Sergeyevich Prokofiev are eminent figures in twentieth-century cultural history, yet this is the first detailed account of their fifteen-year collaboration. The beginning was not trouble-free, but despite two false starts (Ala i Lolli and the first version of its successor, Chout) Diaghilev maintained his confidence in the composer. With his guidance and encouragement Prokofiev established his mature balletic style. After some years of estrangement during which Prokofiev wrote for choreographer Boris Romanov and conductor/publisher Serge Koussevitsky, Diaghilev came to the composer's rescue at a low point in his Western career. The impresario encouraged Prokofiev's turn towards 'a new simplicity' and offered him a great opportunity for career renewal with a topical ballet on Soviet life (Le Pas d'acier). Even as late as 1928-29 Diaghilev compelled Prokofiev to achieve new heights of expressivity in his characterizations (L'Enfant prodigue). Although Western scholars have investigated Prokofiev's operas, piano works, and symphonies, little attention has been paid to his early ballets written for Diaghilev's Ballets Russes. 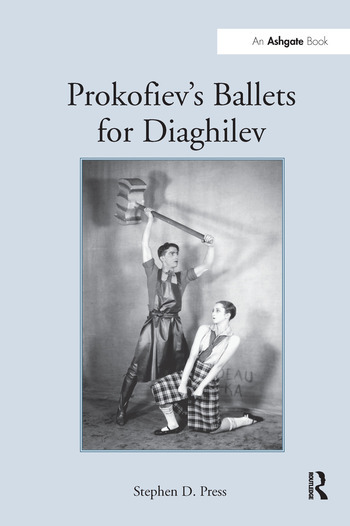 Despite Prokofiev's devotion to opera, it was his ballets for Diaghilev as much as his concertos and solo piano works that earned his renown in Western Europe in the 1920s. Stephen D. Press discusses the genesis of each ballet, including the important contributions of the scenic designers (Mikhail Larionov, Georgy Yakulov and Georges Rouault) and the choreographer/dancers (Léonid Massine, Serge Lifar and George Balanchine), and the special relationship between the ballets' progenitors. Contents: Preface; Introduction; Prokofiev and Diaghilev: the collaboration; The path to success: gauging originality versus influence in Ala i Lolli and Chout; The two versions of Chout and the Suite; Topical appropriations and a 'new simplicity' in Le Pas d'acier; L'Enfant prodigue and the end of a fruitful collaboration; Select bibliography; Index. Stephen D. Press received a PhD in Musicology from the University of North Carolina at Chapel Hill in 1998. He is currently Assistant Professor of Music History at Illinois Wesleyan University.